Wineries and wine enthusiasts from across the region will gather on February 16, 2019 for an unlimited sampling of dozens of fabulous North Carolina wines of all styles and tastes. Then, buy glasses and bottles of your favorite wines, all for great prices!! Enjoy a fabulous selection of tasty nibbles and treats, chocolates, cheeses, and sweets. Food is available for purchase. Take a stroll through the complimentary Candy Bar. Then get some serious shopping done. Browse through fantastic mini boutiques featuring purses, jewelry, clothing and more. Check out Fayetteville Tech's Culinary Department onsite featuring a cooking demo with samples. Everyone gets a free souvenir tasting glass! Tickets to this event are on sale now! To purchase tickets...click the BUY TICKETS NOW link or purchase at the box office. Military Discount at the Box Office. As a courtesy to our guests, we offer a centralized complimentary Wine Check service. It works just like a coat check at a restaurant. If you wish, you can bring your purchases to our Wine Check area and we will hold it for you. We will provide you with a two-part wine label. When you drop off your purchase, please make sure you fill out both halves of the label. You should put one label on your purchase and keep the other half as your receipt. Use of the Wine Check Service is completely voluntary. You are welcome to carry your purchases with you, but if you would like us to hold your purchases until you are ready to leave, we are happy to assist you. If you have any questions, please feel free to contact a staff member. 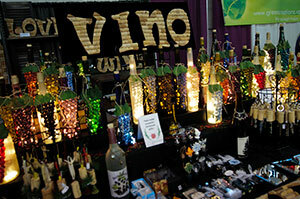 The Wine and Chocolate Festival is not responsible for wine that is not picked up or misplaced because labels were not filled out completely or improperly attached to packages. If you are a winery, distillery or cidery and wish to participate, please download and fill out the registration form. Wine sampling, glasses of wine and bottle sales will be allowed. If you produce/sell chocolate, baked goods, jerky, small snacks or other food items, please use this form. We encourage all vendors to sample and sell their products. If you sell products that are not handmade or crafted, such as purses, clothing, candles, direct sales products, lotions, oils, products for the home or body, etc....please use this form. If you are a corporate sponsor or exhibitor, please contact Amanda Knepp (704) 323-9629 to discuss how we can assist you.